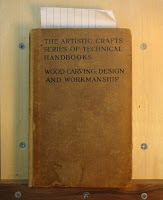 My friend, Dyami Plotke, sent a book to me entitled "The Artistic Crafts Series of Technical Handbooks—Wood Carving: Design and Workmanship." It was printed in 1903 and focuses on relief carving—from choosing and sharpening tools to the do's and don'ts of the craft. The author is very opinionated (alluding at one point to his distaste for a new trend in artwork which he finds to be without merit—presumably Art Nouveau) and points continually to older artforms created in previous decades as objects worthy of study. I love this book. The man who wrote it, George Jack, and I would never have gotten along. His "this is the correct and only way to do this" approach would drive me nuts. However, th e language he uses and his instruction are excellent. 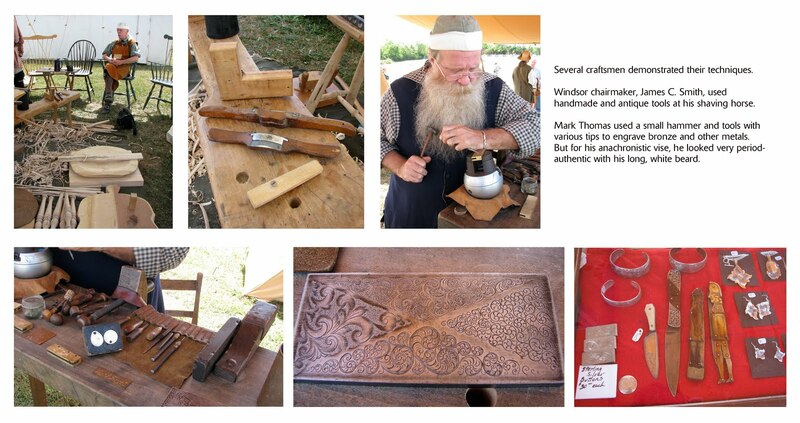 It's motivated me to try relief carving again, so I spent time searching for a centuries-old print to use as a model. 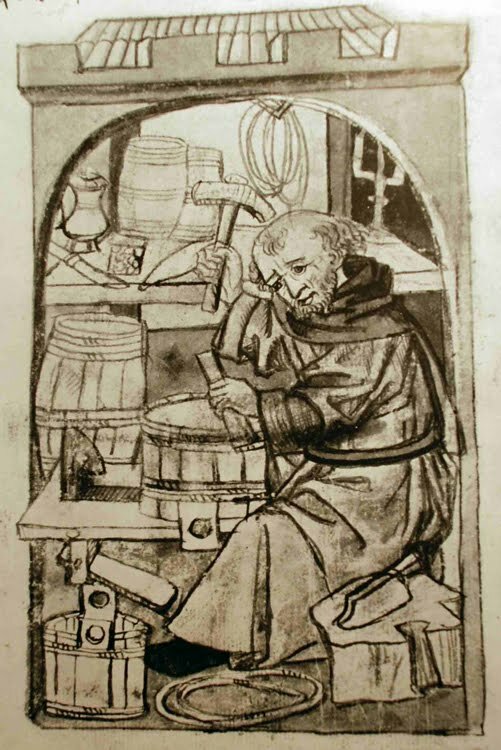 I found one on Peter Follansbee's blog which depicts a cooper in 1485, tightening the hoops on an inverted bucket. The artist had a wonderful eye for balance, negative and positive space, and format. Your eye is first attracted to the face and the central spot in the drawing—his workpiece—then your gaze moves down the cooper's body to the axe on the stump, then circles to the left to view the bucket, and sweeps back up to the hammer. This circular shape is underscored by the arch in the doorway. Upon closer scrutiny, the seemingly crude sketch (in ink, I'm guessing) shows someone who, with use of minimal line, is able to suggest heavy, thick folds in cloth, and who had an eye for detail of a craft which he did not thoroughly know. Check out the shaving horse. It has a dumbhead and footrest, but no bridge, and a gaping space in front of the dumbhead. Unless there was some insert (i.e., ramp or raised bed) that fit into the empty space, this shaving horse appears to be unusable. Plus, as Peter Follansbee pointed out, there is no front leg or pair of legs. However, the artist does illustrate details like iron hoops hanging from the wall and a few of the tools a cooper would use. I was not able to determine two of the items on the rear table, to the left of his swinging hammer. One might be a cup because there is a pitcher nearby. The other looks like a pastry bag. Or corn cob. I opted to change those two objects to a drawknife and head shave. Another thing I changed in my version are the parallel and horizontal lines. I used a plastic T-square and plywood triangle to square up the image. Those things can be fudged in sketches, but, to me, they would look sloppy in a carving. 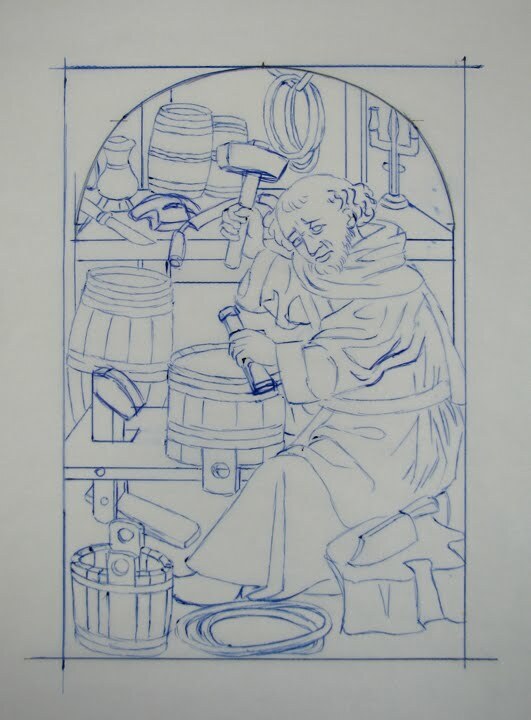 What makes this a nice piece to use for relief carving is the perspective. As Mr. Jack explains, the rules of perspective that apply to painting are not the same as those used in carving: "...all such features [in the artwork] must be treated in a way entirely different to that adopted by the painter—that is to say, in detached groups, each having some due relation to the original surface of the wood, and only very little to their perspective positions." He goes on to say that objects that point directly toward the viewer, in severe perspective, simply will not work in relief carving. The artwork that I have chosen to carve reflects this concept. 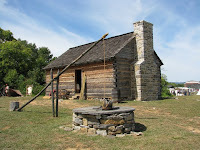 The elements in the workshop seem to be stacked on top of one another, rather than drawn in realistic perspective, and are in lateral and 3/4 view. Now, let's see if I can do this wonderful little painting justice. As the Woodworking In America Conference is quickly approaching, I'd like to turn the spotlight on two more toolmakers I spoke with at last year's conference: Andrew Lunn of Eccentric Toolworks and Gary Blum of Blum Tool Company. 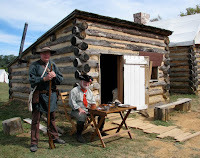 Both men will be at this year's conference, so if you're visiting the Marketplace, be sure to stop by their booths. Because I did not have enough time to speak with them in-depth at last year's conference, I wrote and asked them to tell me about their tools and what makes them special. I suppose the way I would characterize my saws is that they are each made with extreme care, by hand, and have a very considerable amount of attention paid to detail. I am very picky about how the saws function and about how they look. 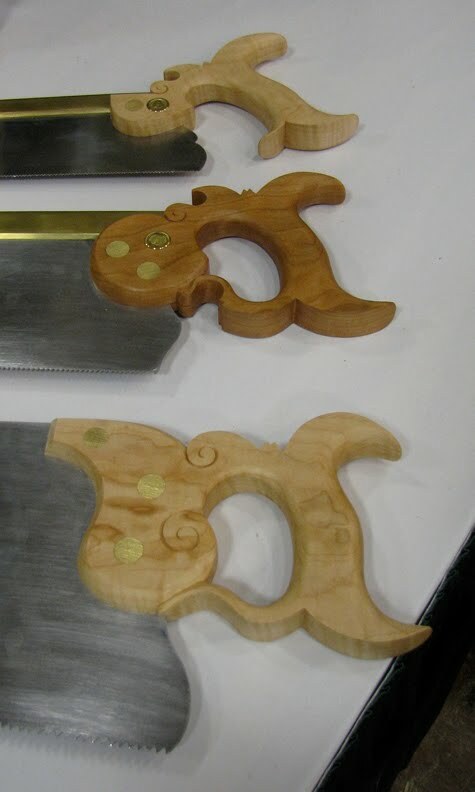 They are not actual copies of existing saws, but are my own designs that are based upon a lot of thought, experimentation, and the study of old saws. 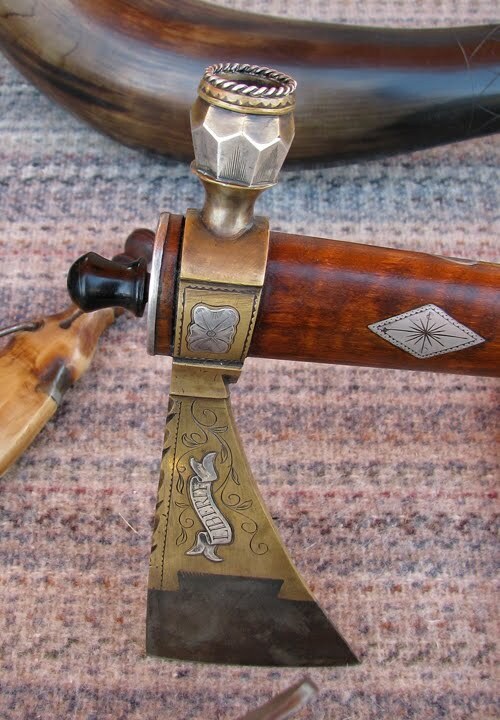 I like giving my saws a unique visual identity, with the carved scrolls, unusual lamb's tongues, and the filework done to the toes of the hand saws and panel saws. My saws are very detailed functionally, as well. 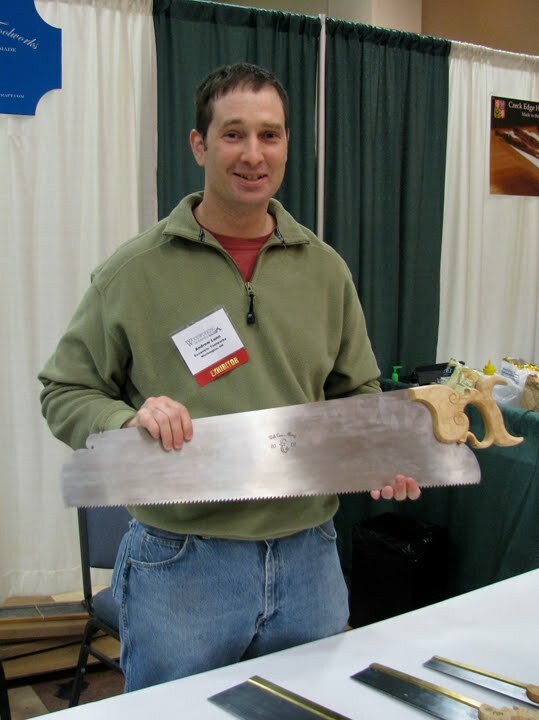 Sawing well is a skill, and I carefully design my saws to respond to, and to complement a skilled hand. 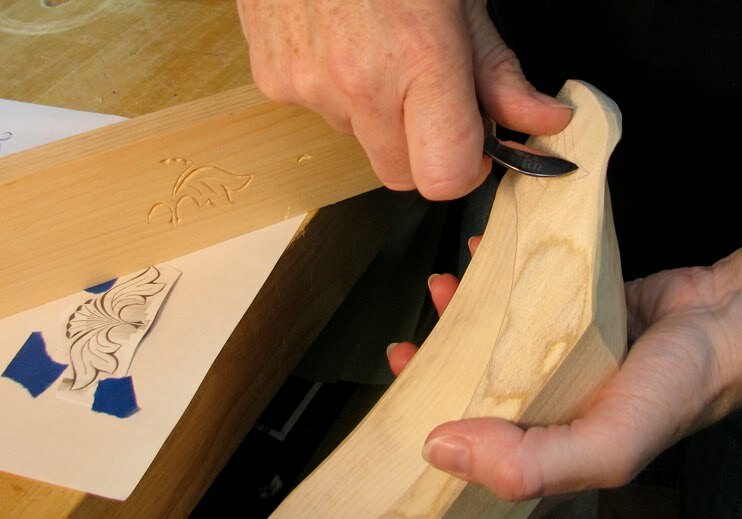 The capacity for finesse and touch are built into the saws themselves. So even though the saws are visually unique, there is also a lot to them that is rather subtle and that you can't necessarily see by just looking at them. You have to use them before you see it. 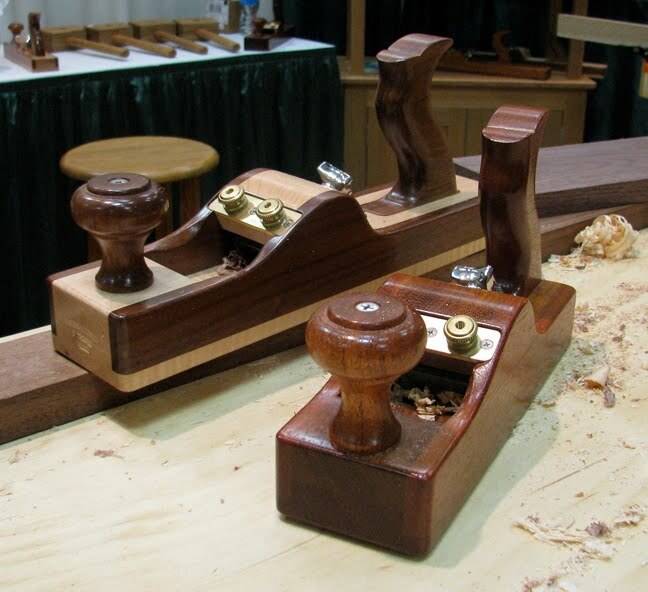 My planes are different in many ways from the standard metal or wood planes. 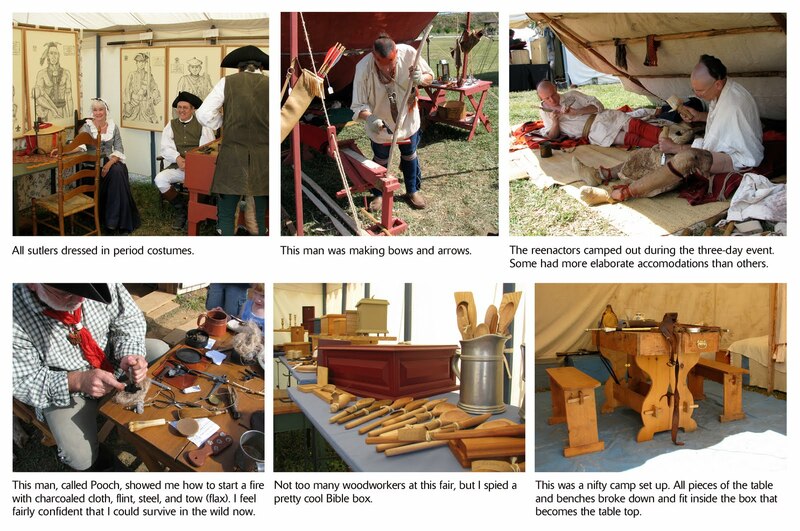 The bottom line, though, is that they take shavings and smooth wood just like any other plane. The big gest thing which sets my planes apart from others is the reverse angle frog. By mounting a frog at this reverse angle, it allows for some very unique advantages for my planes. Depth adjustments are in a direct line with no connections, so there is no backlash in the screws. By having 2 screws for adjustments, lateral adjustments are done at the same time. The front of the frog becomes the chipbreaker, so no separate one is required. The frog itself can be cambered and the small blade simply bent to it by the back up iron, so you can always grind a straight blade and have a perfect camber. 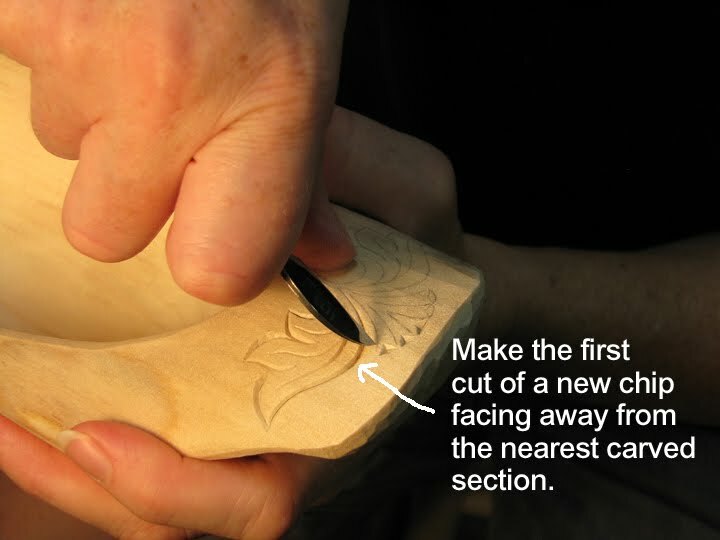 The mouth opening is parallel at the front and back so there is no mouth opening up as the sole is trued. 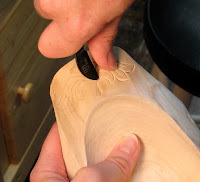 The frog will pivot foreward or back to open or close the mouth and this can be done with no tools. However, my main motivation for developing this plane was to eliminate the grinding step required for the plane iron. 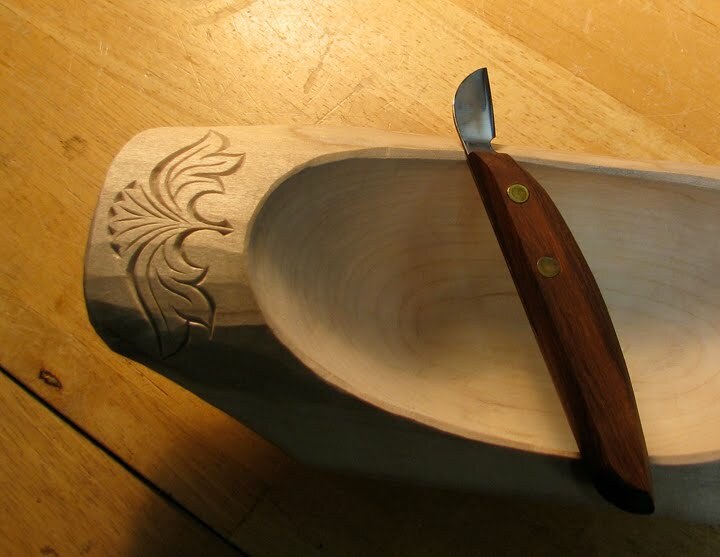 In talking with other woodworkers over the years, the main reason they didn't use their planes ( and therefore didn't know what they were capable of ), was the sharpeni ng issue. The average woodworker does not have a good way to grind a 2 3/8" plane iron to a specific angle, keep it square, and straight, and not burn the edge. My thin irons only require honing, which can be done on a fixed angle jig, so it is a much simpler procedure. I really enjoy the woodworking aspect of making my planes. 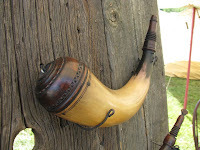 Mesquite wood is my most popular choice, and it's a real pleasure to work with. I also use maple, walnut, cherry, rosewood, and jatoba. I have also done custom woods that the customer supplies. Since my planes are all handmade, I can change various things like handles, finish, length, etc. As I've said before, we're incredibly fortunate to have so many people who devote their careers to making superbly-crafted hand tools. If you can try them out in person, that's always the best way to tell if the tool is right for you. 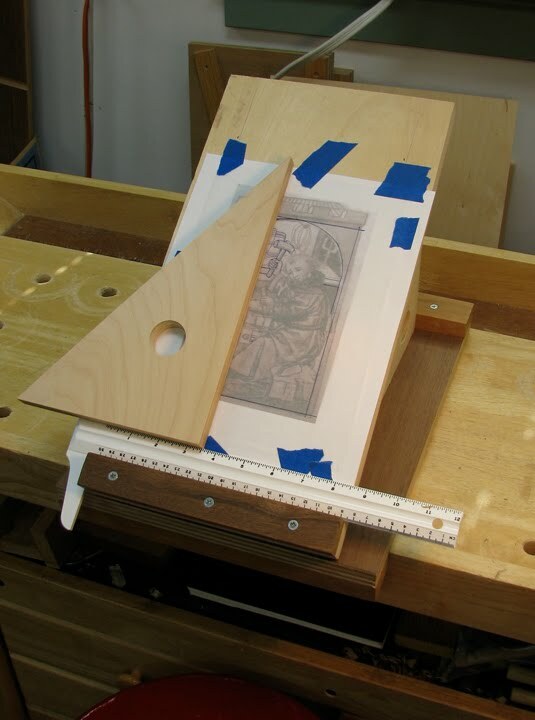 But, if you're not able to attend the WIA Conference, perhaps Andrew's and Gary's write-ups will help in your decision-making as you consider which tools should be employed in your workshop. 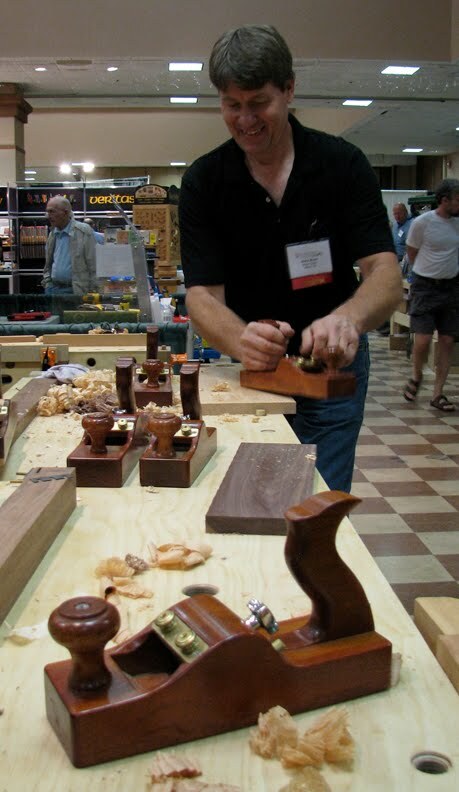 Woodworking In America is just 2.5 weeks away. 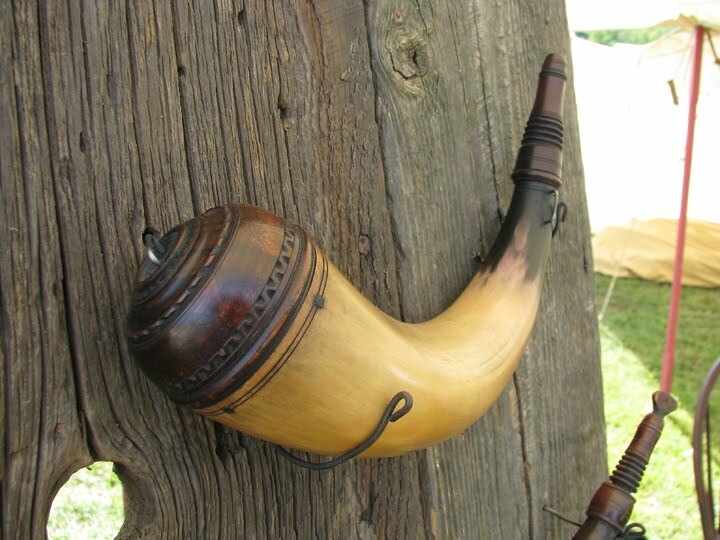 Even if the Conference sold out before you could register, you can still shop in the Marketplace, which will feature 70 vendors, many of whom are hand tool makers. Admission to the Marketplace is $7, but a $2 coupon is available on the WIA site. 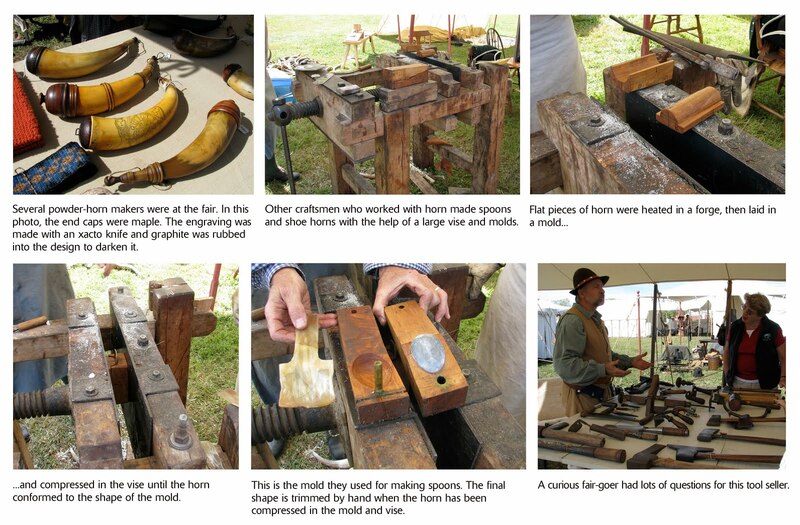 If you plan to attend and you'd like to say hi, you can find me here—bogarting the Sindelar Tool Museum.